Still can't understand how soccer has more supporters worldwide than AFL footy. Over the years, the Bulldogs and their supporters have escaped the scorn heaped upon more high-profile clubs like the Pies and Dons. It’s time to have a bit of fun at the Dogs’ expense. Remember the days when Alastair Clarkson loaded up his team with players possessing sublime foot skills? When power forwards and rucks mattered? When experience mattered? Well, those days are gone. 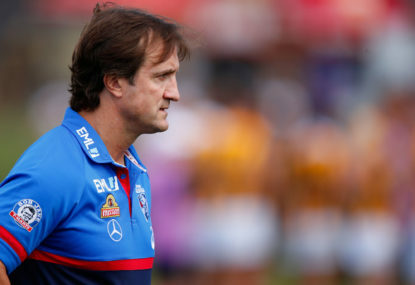 The genius of Luke Beveridge is not the set of ideas that he brought to the Bulldogs, but the ideas he thought up after arriving at the Bulldogs. There are a number of retiring stars this year. Here are some of the well knowns, and some which perhaps didn’t get a great deal of fanfare. 2016 has seen the rise of Tom Scully and the demise of Travis Cloke. The contested marking beasts are on the decline and the aerobic beasts are on the rise. What if drugs in footy was just the tip of the iceberg? What if things in the next decade could get a whole lot worse? 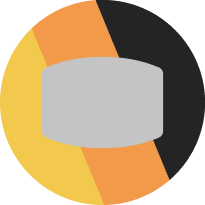 Here’s how it might look. Three claims were frequently made in 2015 that list managers should not believe. With the season opener just a few weeks away, now’s the time to congratulate the last dinosaurs left standing. What did we learn from the Lions' win over the Swans? Brisbane appear to have intensified their ‘moving cage’ game plan, which involves flooding around the ball and then sprinting back into an open forward line when they rebound. What did we learn from season 2014? It’s late October and I’m still thinking about footy. It’s tragic, but let’s face it – so are you. The year 1980 was a year in football that has reverberated massively right through to this day. Where do indigenous footballers stand the best chance of a long career? Congratulations to Eddie Betts on playing 200 games in the AFL. Eddie’s achievement fits an emerging pattern among indigenous AFL footballers in the 21st century. Imagine this. On the eve of Andrew Demetriou’s retirement, the same AFL insider who leaked ASADA information to Caroline Wilson last year has leaked again. Which AFL teams have the most depth? Which teams really have the most depth? Hey, that’s easy, just measure depth by checking the performance of a team’s reserve side. Talk about hot and cold. Two weeks ago, we were finally treated to big Trav Cloke and Jack Hawkins each taking a quarter of football by the scruff of the neck, against North Melbourne and Hawthorn respectively. Only two years ago, decorated full forward Matthew Lloyd was proclaiming the changing game was leaving Nick Riewoldt behind. Pre-season is a bit like Christmas eve – full of positive vibes and anticipation. But surely not every team can be heading up the ladder in 2014. The performances of Sydney in 2005, Hawthorn in 2008 and Collingwood in 2010 show that innovative game plans can help a team win a premiership. Earlier this month, I wrote of the growing importance of half back line contests in deciding AFL games in 2013. 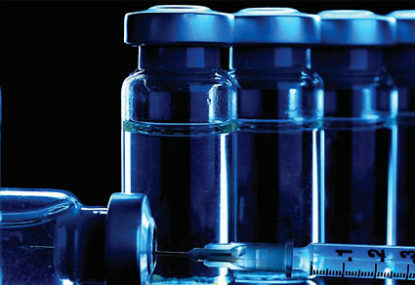 With the announcement of new retrospective legislation, ASADA is faced with a backlog of pharmacological experiments to investigate. We await new disclosures on the following cases. Great analysis Pinidu. The other Buckley tactic that worked beautifully was tagging Dusty. With Dusty covered and Shaun Griegg injured, the Tigers’ midfield looked small and inexperienced. Pete your analysis of the different roles of the Pies midfielders is great. I’m just not sure about yours and Ayden’s views on what makes a top midfield. The current Pies midfield has plenty of class but doesn’t match the Hawks or Cats midfields of 2013-2015 and 2007-2011 for inside intensity. Taylor Adams is the only genuine inside midfielder (with Sier and De Goey still learning the craft). 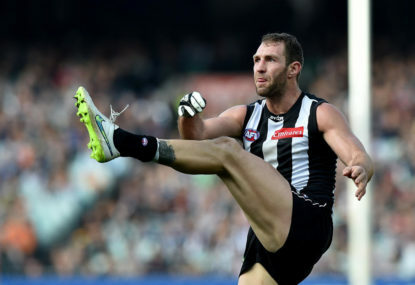 In big moments in games, we really need two of those hard-bodied in-and-under types at centre clearances, not a whole bunch of Rolls Royces (Pendles, Treloar, Sidebottom, Wells). Yes, well argued Samuel. Shiel will add some needed class to the Saints’ midfield but big games require midfielders with strengths in leadership, contested possession and tackles. Shiel has none of these and is not a recognised big game performer. The Saints should not over-spend on Shiel. Seems like a pretty speculative article Ryan – not really providing persuasive reasons why the Eagles won the flag. 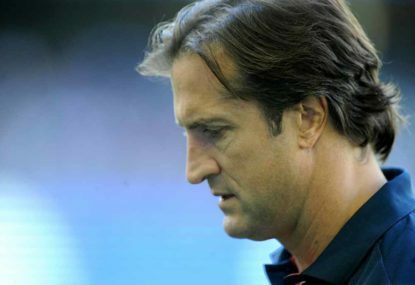 You’ve noted that ‘coaching panel changed significantly from last season….bought the positive change in attitude it fosters to the way it goes about its business [and]…are a serious commercial enterprise masquerading as a public trust, and that has played a far more important role than anyone from within or without the club may care to admit. But you haven’t explored those factors in any detail or explained how they might have impacted the Eagles’ season. Your best analysis of why the Eagles won the flag was your observation that ‘The ball moved swiftly, but through the air, not on the ground’. Or maybe I’m just feeling grumpy ‘coz I’m a Pies supporter. I was happy enough with our coaching moves. We were right in the game throughout, so no need to take big risks with ‘shuffling the cards’. Agreed that it might have been good to give Thomas a run in the middle much earlier (he wasn’t getting much of the ball up forward) but the main move that they missed was Mayne to McGovern. Leaving Myacek on McGovern was costly. Sidebottom was great for most of September and even on Saturday his effort was huge, covering more kms than most players. 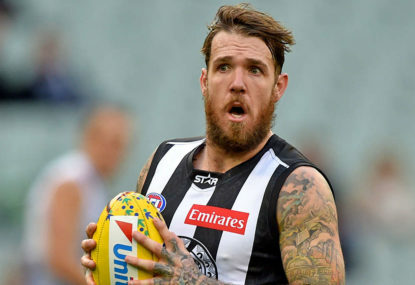 The Pies’ problem is that we rely on Sidebottom too much, especially as other Pies players begin to tire and become less daring in the second half. I think Bucks placed too much faith in another Magpie leader, Pendles, who should have swapped with Crisp for much of the day. Crisp is much harder at the ball than Pendles and much faster over the first few metres, and that’s what we needed on Saturday. Agreed, Grundy had no impact. And he probably wasn’t helped by his midfield, whose clearance work was below par. The dominance of Shuey and Sheed says it all. Pendles was okay in patches but lacks the reflexes that he once had; he needs to spend more time down back than in the midfield next year. Kelly, Duncan and Ablett are more outside than inside, and many of their forwards are also a bit too outside. Geelong would definitely benefit from recruiting a Dalhaus-type for their midfield and demanding more pressure from forwards like Narkle, Menzel and Ratugolea. The Eagles have a B-grade midfield but it was their midfield that drove the Eagles’ great final quarter. I thought Lysett matched Grundy over the 4 quarters, which was a feat. The match showed there’s a huge difference between a mobile tall forward like Darling or Kennedy and a less mobile one like Cox, especially on the hard grounds out west. Dougie your 5/6 theory for the forward line may be correct. It’ll be tested next year. I’ve got another theory – 5/6 members of the backline must have played a lot of games together as a unit. Your doggies stretched that theory a bit last year but it’s held up pretty well this century. (In contrast, the Tigers in 2017 have shown that the forwards don’t need to have played that much together at all!). And PD’s well qualified to make that observation, having watched his Bulldogs’ disinterested play in 2017. A questionable cultural influence? Ablett was the most professional bloke at the club. Have you heard Campbell Brown talking about Ablett’s strict diet and other preparation? I agree with Cat that the club let Ablett down. 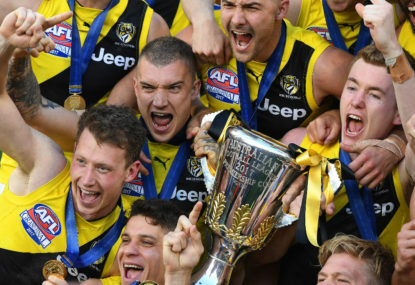 Cat, Richmond just won a premiership with a more extreme version of the Bulldogs’ plan. But I think you’re mostly right. New ideas can give an enormous edge. Some new strategies in 2018 might be to more effectively use blocking to open up space, to load up the defence with speedsters, or to increase the speed of handballing in the backline to cope with the forward press. Just speculating. Interesting comment about Graham’s pace but his stats say he averaged 7 tackles per game in 2017, the highest among all rising star nominees (see https://www.footywire.com/afl/footy/pp-richmond-tigers–jack-graham). So perhaps he doesn’t contradict the Tigers’ game style. Don this is probably a good note to end our ‘debate’. It’s how you end most of your debates. But I’d be keen to read any article you wrote to inform the rest of us plebs about Freo. Please include some objective data in it. Thanks Aransen. And just to add to Aransen’s list, Mason Cox, Kurt Tippett, Jack Redpath, Josh Jenkins, Levi Casboult and Ty Vickery all have the turning circle of a mack truck. This is increasingly a disadvantage in today’s footy. 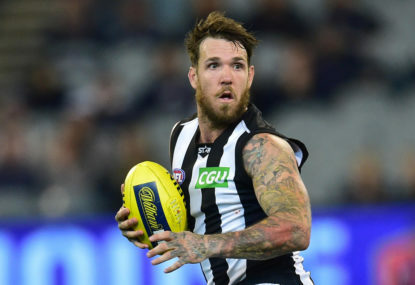 Alongside Charlie Dixon, another power forward who may survive is Jonathan Paton but the tall forwards who can provide consistent value are the more agile ones like Jack Riewoldt, Buddy Franklin, and Jeremy Cameron. I’m tipping Wylie Buzza to edge out Hawkins at Geelong in 2018 and Darcy Moore to be the only tall forward (bar injury) in the Pies forward line in 2018. Actually I agree with Anon. Lyon has just woken up and realised that instead of wasting time on dud talls up forward (trying to replace Pav), he should have been breeding a mosquito fleet that could lock the ball in. I think he’ll go that way in 2018. Philby I didn’t say the guys with sublime foot skills would be dropped. I think, as we saw with guys like Laird, Walker and Lynch in the GF, that the guys with sublime foot skills will have less time to execute their sublime foot skills. Subsequently, other skills will become more important. Certainly the skilled players will need to apply elite pressure. But they’ll also need to learn to execute their sublime foot skills under increased pressure if they want those skills to remain key to a team’s success. N Y Hawk you’re right about that fantastic pressure Freo applied in the 2013 prelim. But they did that on the smaller Freo ground. They couldn’t apply that pressure against the Hawks on the MCG a week later because applying such pressure on the bigger MCG requires more speed and they didn’t have enough speed. Yes the Pies of 2010 had a great forward press (I’m a Pies fan) but we still had some slower guys like Cloke and Didak in that press, so it wasn’t the same standard as the 2017 Tigers. Don we’ve all seen plenty of supporters like you who quote their list of up-and-coming players endlessly as stars and implore other supporters to see the light. With depth like Blakely, Grey, Langdon and Balic (and Ballas clearly past his use-by-date), no wonder Freo struggled in 2017 (in fact most of those guys got a run in 2017 BECAUSE you lacked depth). I’m not a Tigers’ fan but I’ve seen enough of Bolton, Lennon, Menadue and Llloyd (and seen that the new look Tigers can seamlessly slot new role players into their team) to know they represent genuine depth, and the fact that the Tigers’ reserves team made the VFL GF is pretty objective evidence of their depth. Gordon that’s a pretty convincing argument for the rise of Richmond’s backline and for giving them more kudos for their finals work. They were a great unit. I’m surprised that Houli was given so much latitude in the GF, much as Johanissen was given too much latitude in the 2016 GF. Another tactical error that Adelaide made up forward was playing a 3rd tall (Otten), which reduced the Crows’ forward line’s defensive pressure and was never going to stretch the Tigers’ defence (which contains plenty of guys who can play on talls). A 3rd tactical error was that the Crows really didn’t adopt a plan B when they were sinking fast in the 3rd quarter. So yes the Tigers’ backline deserves plaudits but I think the Crows’ tactics up forward also deserve criticism.. Depth is a consistent characteristic of premiership clubs. It has never been a characteristic of Freo. Did you turn the TV off 5 years ago Don? And the Tiger forwards showed not just a completely different level of scoring capability, but also a different level of pressure capability. The Hawks’ defenders in 2012-2015 could generally go sideways or backwards to find a fellow defender who had time and space to deliver precisely. But in 2017, Tiger forwards didn’t allow Crows’ defenders to even go sideways or backwards to find a team-mate in space. There were no team-mates in space. New York Hawk seems to imply that the game hasn’t changed but it has, and those rebounders with elite foot skills will now need to execute those foot skills with even less time than in 2012-2015. Craig your first paragraph makes perfect sense. The trend towards speed and pressure will continue, particularly in forward lines. And this will require new ways to counter a pressure game style. Maybe recruit rebounders who can shrug off tackles (a la Dusty), who can accelerate off half back (a la Johanissen), who can kick precisely and creatively with only a fraction of a second (a la Sam Mitchell). Or maybe defenders as a unit need to get even faster at flicking handballs around (to find someone in space) than the Crows’ defenders were. I think the only thing that will stop the decline in tall forwards in 2018 is not ‘fairer umpiring’ (the GF was well umpired) but perhaps a change in the rules!